The 8051 microcontroller was invented in 1980's by Intel. Its foundation is based on Harvard architecture and this microcontroller was developed principally for bringing it to be used in Embedded Systems. At first it was created by using NMOS technology but the use of NMOS consumed more power to work therefore Intel re-launch the microcontroller 8051 using CMOS technology and new edition came up with edition of letter 'C' in the title name, therefore the new modified version of microcontroller is called by name 80C51. The 8051 microcontroller programming is performed in embedded C language using Keil software. 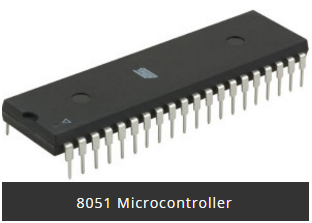 8051 microcontroller offers a number of special features such as ADC, UARTs, Op-amp, etc. The 8051 microcontroller applications include a large amount of machines because it is used for incorporating inside a project or to assemble a machine using it. Energy Management : In energy management system the measuring device is used for calculating the energy consumption in industrialized and domestic applications. These systems are manufactured by integrating the microcontrollers inside their architecture configuration. Automobiles : Microcontroller 8051 is to be used for providing automobile solutions. They are largely be used in hybrid motor vehicles to control engine variations. Touch screens: The advanced degree of microcontroller integrate the touch sensing ability within their design .Transportable devices such as cell phones, media players and gaming devices are some example of microcontroller integrated with touch screens. Medical Devices: Microcontroller is used in various medical devices such as glucose and blood pressure measurement machine for monitoring and measuring the exact result in real-time computational environment.